Explore fractions greater than one with the Fractionator, a fraction-tile-making machine in the Gizmo. Create sums of fraction tiles on two number lines. Sums greater than one are shown as improper fractions on the top number line, and as mixed numbers on the bottom number line. Add fractions with like denominators. Understand the meaning of a fraction with a numerator greater than its denominator. Convert from improper fraction to mixed number, and vice versa. 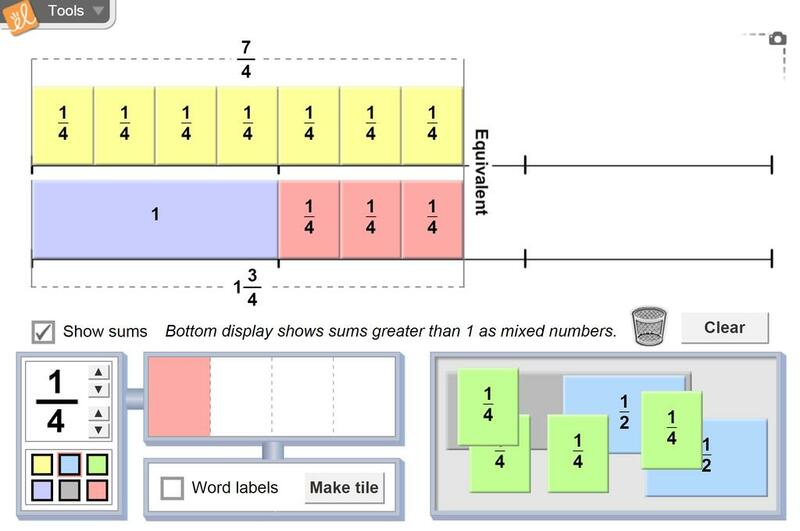 Add fractions with unlike denominators using the least common denominator (LCD). Express the sum of fractions as an improper fraction and a mixed number. Just did a demo on this before I use it in class tomorrow. Like it a lot!